Come and learn how to create an amazing sugar science fair project. Watch what happens when you boil soda and fruit juice. Amaze all your school friends. 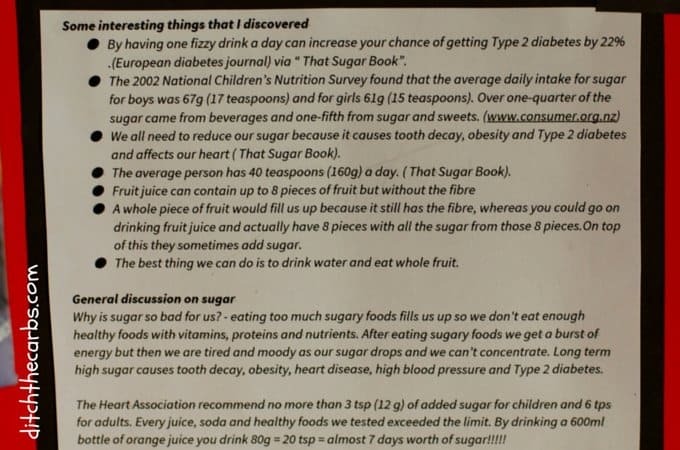 My son recently competed in his school science fair, I thought it would be interesting to share his results here, and it might give some tips for anyone wanting to conduct a similar science fair project on sugar. 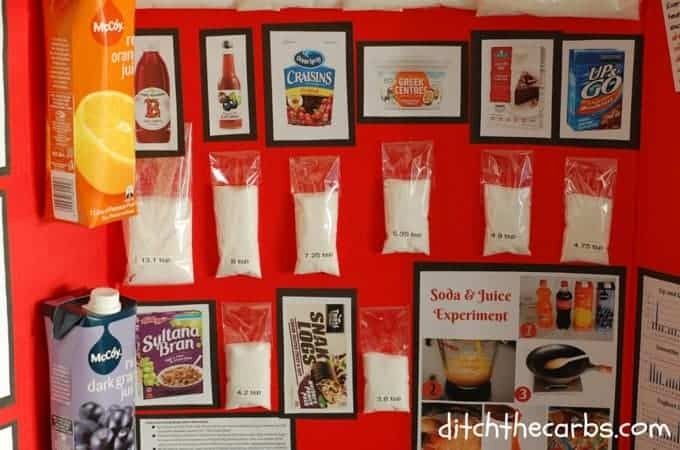 Sugar science fair projects are increasingly popular as people are becoming aware of the just how much sugar is in everyday foods and drinks. It is fun to do and children love the shock tactics of hidden sugar. 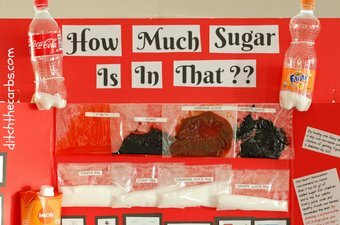 I was amazed this year how many science fair projects were related to sugar in some way. It’s a hot topic and that is fabulous that kids want to get on board. And seriously, if you want your children off soda and juice, DO get them to try this at home (with adult supervision of course). 600ml (20 fl oz) of each soda and juice were measured. This is a common bottle size, but no where close to the 2.5 litre bottles some people drink. Each soda and juice were boiled down leaving the sugar remaining. My son wanted to see just how much sugar is in soda and in fruit juice, and if fruit juice is any healthier. Watch this video I put together of him boiling soda and juice, but there is a warning, you may never drink soda or juice after watching this. It really brings the message home that these drinks are nothing but liquid sugar in a bottle. That sticky horrid mess left over at the end, he popped into sealed bags for everyone to see. His sugar science fair project is now on permanent display in the science block. You may notice the gloopy sticky mess that soda and juice become once the water has evaporated. This alone should put you off them. The sugar found by his experiment is pretty close to what the nutrition labels state. It shows the incredible sugar contents of these drinks. Most have 20 TEASPOONS of sugar. 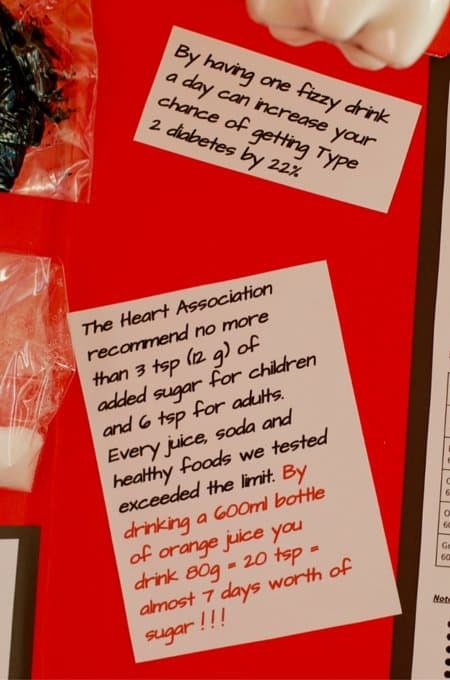 Now I don’t know about you, but I sure won’t be giving my children 20 sachets of sugar when they are thirsty! And don’t think juice is a healthy option. Sure it may contain some vitamins, but there is no fibre and most are heat treated or made from concentrate. Drinking a glass of juice isn’t the same as drinking the goodness of 6 oranges, it’s the same as drinking the sugar of 6 oranges. Eating whole fruit with it’s fibre is self limiting, juice is not. By drinking one 600ml bottle of juice or soda, children are drinking almost an entire weeks worth of their recommended daily intake which is 3 tsp/day. 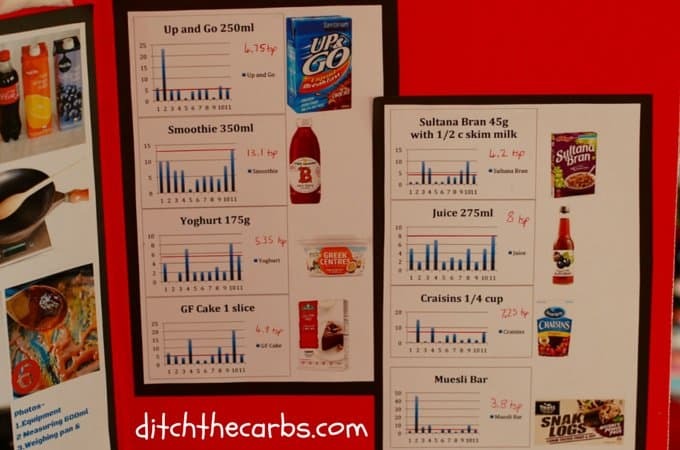 As you can see by these graphs, not many adults managed to guess how much sugar was in these ‘foods’. The majority of adults underestimated their sugar content by a considerable amount. Remember – read the back (nutrition) of the packet not the front (advertising fluff and wonder). Actual sugar content in these products. Hi my daughter and her friend are doing this project for the science fair and they have to write a independent, dependent, and a controlled variable do you remember what your son put for them? My son didn’t have these requirements for his project, so sorry I can’t help you out with these. The only “control” he used was for boiling the soda, he used a diet coke. how did you measure the sugar to find out how much sugar was left? You measure the pan then deduct the weight of the pan = sugar. I think a cooler experiment would be to super saturate some Coca Cola with sugar so when you add one granule of sugar it will cause a chemical reaction that pulls all of the sugar out of the liquid so that the bottom half of the Beaker is pure white sugar and the top half is the cola now without any sugar. This would require stoichiometric calculations but be an awesome demo that would show all the sugar! My school is asking for a Purpose to this experiment…did you have to do this? The purpose is to create a visual representation of the (supposedly startling) amount of sugar in common soft drinks; and whether or not “natural” drinks like juice are actually healthier than soda pops as far as sugar content goes. An earlier comment has made a valid point that the “experiment” needs a control. It also needs a hypothesis and subsequent analysis and findings/conclusion. The purpose of an experiment is to validate or invalidate the hypothesis; find it true or false. Without a hypothesis the experiment has no purpose other than it’s probably fun to simmer some Coca-Cola until it’s a bunch of glop. I would use a hypothesis like: “ Cola has more sugar per serving than Concord grape juice from concentrate.” Or perhaps that it does NOT. The hypothesis has to be a simple true or false statement it shouldn’t be overly complex like “cola has more sugar than conchord grape juice from concentrate but not when it’s sat out and the grape juice is welches and the cola is RC, but if it’s Coke it’s less because of acidity and…” make the hypothesis simple. The control is to show that the experiment has valid evidence. So something like a placebo is a common control, so using something like a diet drink or even just water which would boil down to maybe some minerals. Anyway record your results and then apply them to your hypothesis and see if you were right or wrong. It’s okay to be wrong! Just make a detailed analysis of why you were right or wrong and conclude with some forward thinking ideas of what your findings could mean for future experiments and how it applies to everyday life. Hope this helps! Remember don’t try and make a hypothesis you know will be correct just to get it right. Do something you think is intriguing! It’s onay to be wrong! Do something like Coca Cola has less sugar per serving than OJ from Concentrate. Who knows! I want to do this for my science assignment at school. I tried it yesterday but it stuck to the pot that I used. Did this happen to you? Could you explain in further detail about boiling the certain beverages and if they stuck to your pan? Yes it does stick, and badly. I bought an old pan from the second hand thrift store. I weighed the pan empty, then weighed it again with all that horrid sticky sugar. Pan with caramelised sugar – empty pan = caramelised sugar. Once I had the results, then I would heat it gently to lift off the caramelised sugar, and washed the pan in hot hot soapy water. Repeat with each soda. Hi libby. What was your hypothesis for this experiment. The main experiment was asking a selection of people if they could guess how much sugar was in the “healthy” foods shown on the graphs. The soda boiling experiment was an additional part of his project to highlight soda and juice. Hi Libby my question is what do the graphs show exactly? My son is sitting right next to me now (perfect timing) and he remembers they are showing how much sugar his participants guessed were in each “health food” compared to how much is actually in them. I did this with my daughter, the trick is not to boil it. let the liquid evaporate on low heat. I then poured into sample cups and put them in my dehydrator. so are you measuring how much other things are in there other than sugar or are you measuring the how much sugar is in a drink? do it. Is his first time doing this science fair . Thanks If you can send me at me email appreciate. What would the hypothesis be for this project???? 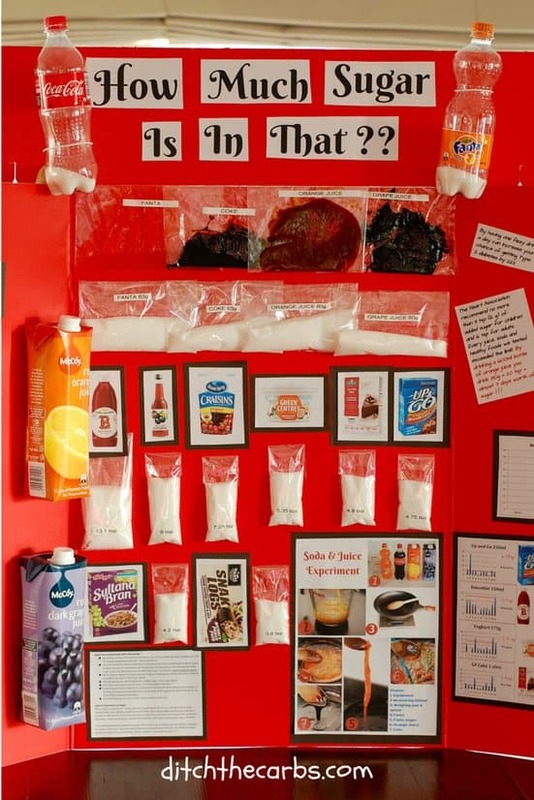 The main body of the science experiment was for people to guess how much sugar was in (what many perceive to be) “health foods” such as low fat yoghurt, dried fruit snacks etc. His hypothesis was that not many people would (and they were shocked as he revealed the answers afterwards). The boiling experiment was an adjunct to his project, a visual guide to shock his class mates. His school asked to keep the project and it is sitting in their science lab, so long may it put them off huh? How did you find the measurements for the food? Which food in particular? I think he chose serving sizes from each packet for the snack food, and chose equal liquid volumes to compare for the boiling experiment. I was wondering what orange juice was used resulting in the same amount of sugar as grape juice. All the orange juice I have found has 22 g per 8 oz serving according to the label which is considerable less than grape juice. It was also less than coke according to the label. We are also doing this as a science fair project. I haven’t done any of the boiling down of the drinks or weighing I was just calculating based on grams per serving per label to get an idea of what the results should be. The photo shows Mccoy orange juice and Mccoy grape juice. Both are pretty shocking yet count as a daily serve of fruit and veg. Unbelievable huh? It’s very hard to find their values as they are not on their company website (funny that). My son used the values from the packaging for the project. I am doing this for my science fair. How do you measure how much sugar is in the soda once you have the goo from boiling. The formula is above, but you weigh the empty saucepan, then again once you are left over with the sugar ‘goo’ in the saucepan. Deduct the empty pan weight from the sugar filled saucepan weight = sugar (approximately, it’s not a rigorous scientific experiment here, just a really excellent school project that gets the message across). Hi Libby! I was wondering, for the “weight of the pan with sugar – weight empty pan = sugar” thing, what would I use to weigh the pan? I’m doing this for my science fair project, and it doesn’t say what kind of scale I would use to measure it. Oops! Where I said “and it doesn’t say what kind of scale I would use to measure it.”, I meant weigh not measure because I need to know how to weigh it, not measure it. Sorry about that! He just used our digital kitchen scales. They measure quite accurately for an experiment like this one. Good luck. Hey, i can’t see the steps for the experiment from the board. Any way u can see it to me? The video pretty much shows what he did. He just boiled the same quantity of soda or juice. Once all the liquid has been evaporated, you calculate how much sugar by using the equation “weight of the pan with sugar – weight empty pan = sugar”. 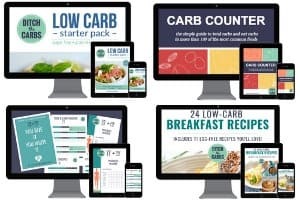 The majority of his experiment was actually asking a variety of people to guess who much sugar was in foods that most people regard as a healthier option. What would I use to weigh the pan? Libby , In which section of science is this project in ? It was a general ‘science fair’ so it wasn’t categorised (from memory). It was that most people would not realise how much sugar was in foods that many would regard as healthy. Also people would be unaware of how much sugar is in soda and juice. Love the idea!! What was his hypothesis? HEY LIBBY, DO YOU THINK THIS PROJECT IS GOOD FOR A 6TH GRADER? Sure, you can just adapt it to their level. Go for it. Thanks so much for sharing!! My son has a science fair project coming up and he wants to do this!! It is so amazing to know how much sugar we intake in every junk food that we eat.Thank you so much for the info. Hi there Lbby, great science fair idea! I’m looking to this with my kids who have just started high school. How did you determine the total amount of sugar left behind after boiling the liquid? Great Rob, I would love it if this inspired someone else to do this. It’s great fun. Weight of pan with boiled down sugar gloop (g) – weight of empty pan to begin with (g) = Sugar (g) in the soda (once boiled down and all the liquid has evaporated). You have to wait until the pan is cold enough to put on the electric scales and the heat won’t affect the accuracy and weight (which may make scales fluctuate). To remove the sugary gloop from the pan afterwards, just warm enough so it is soft, but not remotely hot, then put the gloop into bags to add to the science display. There may be a small margin of error in this if you don’t make sure that all the liquid has evaporated, but if you are gentle with the heat towards the end, you can see when all the steam has stopped escaping and the sugar suddenly turns toffee like. My boy was only 11 when he did this so maybe if he was in secondary school, he may have done it a little more scientifically with a moisture meter, or such. I hope this helps, Libby. What grade level is this for??? He was year 7 (age 11). What research websites did you use. Hi Libby! My daughter is looking at doing this for her science fair project also. Can you please give the steps you took in boiling down the drinks? At what point was it taken off the heat? Also, how did you get it into the bags then without the plastic melting? Awesome Cindy, you daughter will have fun doing this. My son weighed the pan cold before adding the soda so he knew it’s empty weight. He then added the soda and boiled it down, stirring occasionally until no more steam evaporated. At this point you keep the heat low as you don’t want to burn it. Once it was cold, he weighed the pan again with the remnants of the soda sludge (sugar) and deducted the dry weight from step one (you can’t weigh a warm pan as it will make the electric scales fluctuate and give an inaccurate reading). You can then put the pan back on a very low heat, just enough to warm the soda sludge (it hardens when cold) but not hot enough that it will burn the plastic bag. Luckily at this point you already know the accurate weight of the sugar so you only need to get as much as you can into the bag for demonstration purposes, you will never remove 100% as it is a gloopy mess. Wash in really hot soapy water and repeat the above for all the soda’s you’re testing. Good luck and feel free to ask any more questions. Libby. What a great post Libby. Well done to you, and especially your son, for highlighting much needed awareness. Thanks Jan. He is loving the fact that so many people want to do something similar and he is loving the comments flooding in from all over the world. i’m so happy to have found this post, bravo!! so excited to see awareness, i remember charts like these when i was little, it had captain crunch and stuff… it really never sunk in how bad it was for me. I’m starting a ketosis lifestyle very soon, and i can’t wait to experience a new realm in wellness. Great idea! I definitely agree that there is a heightened awareness around the sugar content in our foods… now we just need people to understand that complex carbs turn into sugar in our blood and have the same effect as simple sugars!!! I wonder how we could turn that into a science project? Wow that certainly brings home how unhealthy the drinks are, much more than the little plastic bags of sugar. Well done to your son. Well done, Libby’s son! I work at a high school where health class is mandatory. I have shared this with some teachers and will share with more people tomorrow. And the video ….it needs to go viral! I book mark your recipes. Have made your Fat Head pizza 3 times. I know, I should try your cauliflower crust version, and eventually will, but your Fat Head recipe is so darn good. Hi Libby, love this project! What do the graphs depict? I couldn’t magnify the pictures so I could not see what was being measured on the graphs. Thanks!! The graphs show each participant’s estimate of the sugar in each food, then the red line is the actual amount. A few overestimated, but the majority underestimated incredibly. Thanks Bob. My son had a fun time doing it too. It was incredible to see how many science fair projects are based on exposing sugar and junk food each year. It’s encouraging.